Next along The Dreamer’s journey in the major arcana is 7-The Chariot. The Chariot card refers to the beginning of a big adventure. The Chariot card is a card of success signifying the part of us that wants to win. It can represent a promotion, job offer, or award. It can also symbolize a big upcoming trip. The Dreamer has been on the journey for some time now and perhaps has encountered any number of life challenges. It seems there is always someone or something tugging on us, asking for our attention. The Chariot card reminds us that the power to see our dream to fruition is within us. Self-discipline, determination, and a strong desire are what is required now. The Chariot card is about balance. The charioteer in both the Rider-Waite (RW) tarot and Angel Tarot is being pulled by two animals, one black, and one white. In RW tarot the animals are sphinxes and in Angel tarot they are horses. The black and white symbolize opposing forces. RW tarot suggests the contrast represents the Ego and the unconscious. In the RW tarot the charioteer has no reins and in the Angel Tarot, the reins of the charioteer aren’t real. In Angel tarot, they represent the energy to see desires come to fruition. On the side of the chariot in the Angel Tarot is the Merkabah, also known as Metatron’s Cube, a symbol of sacred geometry. Focusing on this can help us to realize that we have the power to manifest anything we desire. The number seven signifies single-mindedness. It is a very spiritual number. 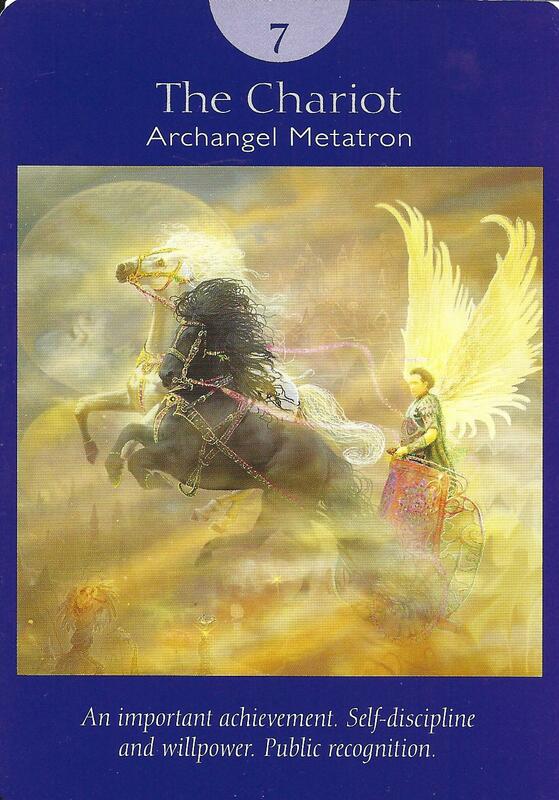 The Chariot card is associated with Archangel Metatron who is one of just two Archangels who were once human. It is believed that he pleased God so much that he rode a Chariot of fire to heaven. 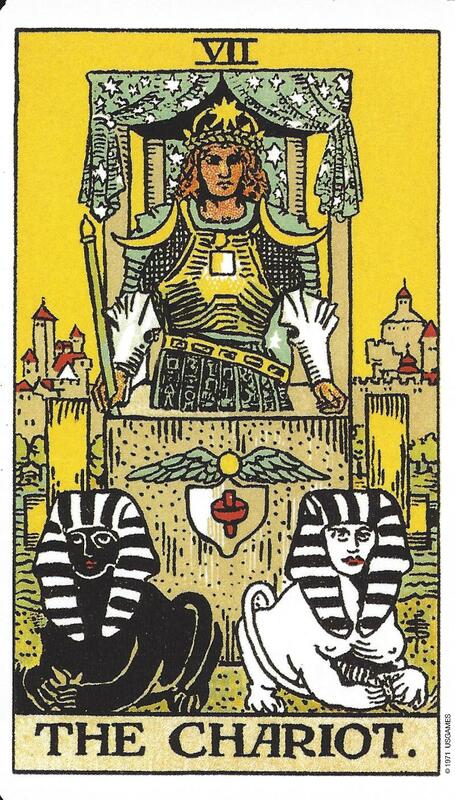 If The Chariot card is drawn it can signify a successful balance or resolution to a recent challenge. The ability to put Ego aside and see both sides, take action, and then make important decisions has paid off. Congratulations! But don’t get too caught up in the joy and success. There is still need for calmness and self-control if you are to go the distance. The Chariot card can represent self-discipline, willpower, or a big leap forward. It can also indicate travel.